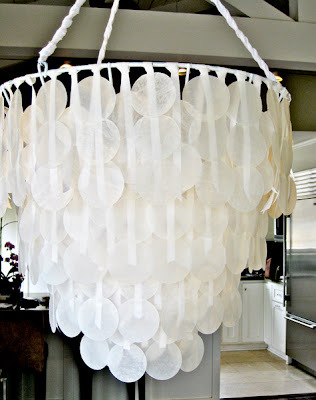 Make a faux capiz chandelier with Brenna at Design Sponge with wax paper, clothes iron and a flower basket. If you don't care for the ribbon strands, Monica Ewing at Crafty Nest shows you how to use thread instead. I like this soft take on the capiz lampshade. The nod it makes to traditional fabric shades is an interesting gesture.